If the complexity and enormity of migrating PE’s to Asset Analytics (PE2AF) has slowed your company’s migration of your existing PI applications and there is no end to the project, then you should watch migrating Performance Equations to AF Analytics​. In it, David reviews what the tool does to make the migration easier and how the tool will support you in verifying that the AF Analytics will provide a faithful replication of the results you have been getting from PE’s. Maintenance is greatly simplified by defining an AF Analytic template once and then using its attributes to represent the PI Tags used in many essentially identical PEs. 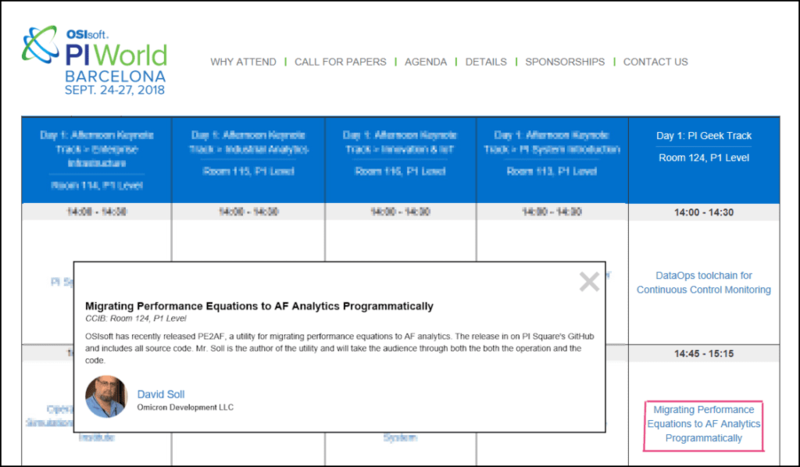 The AF Analytics engine is designed to deliver much higher performance than Performance Equations can provide. Additionally, with AF Analytics a new or revised template can be used to create new information based upon PI Tag values that were recorded months ago. With performance Equations, however, the only information that can be backfilled is for the PE results that were already stored in the PI archive. Finally, AF Analytics provides more flexibility in scheduling and more high availability options than PEs permit. This tool automatically recognizes similar PEs that differ only in the tag names and that they can be replaced with a single AF Analytics Template. Or you can override the utility and exclude some PEs from using the template. In fact, you can stop where you are and save the current results, perform needed research and then continue at a later time. When you are ready to go live, it just takes the click of a button to stop the affected PEs and performs the migration for you by adding the necessary input tags to AF elements as attributes. You can trust the resulting AF Analytics templates because with a click, PE2AF runs the same test data through each template and the PEs it will replace. It will show you whether the results are identical or have a difference of less than .1%. Plus, it validates that all the PI Tags used in the PEs do exist before loading them into the AF Elements. The AF Analytics templates are migrated only when you decide the results are acceptable to you. The utility gives you complete control in picking which PEs to analyze. You can pick a few dozen or you can let the utility identify and process all PEs in your database. Like all good things, there must be an upper limit to the quantity of PEs that can be processed, but the limit has not been found yet. The PE2AF Utility consists of a single executable with a Wizard style interface that can be run from any PI client (server, desktop or laptop with the PI AF client installed, version 2015 or later). Check out the tool at OSIsoft GitHub PE to AF Migration Utility​. David Soll’s presentation at PI World EMEA 2018 in Barcelona was part of the Day 1 PI Geek Track. OSIsoft released the PE2AF tool, of which Omicron was the principal developer, just before PI World in San Francisco. Omicron stands ready to work with you to achieve the benefits of tested and migrated AF Analytics. Call us at +1-609-678-0110 or email us at sales@omicron.com with any questions you may have.